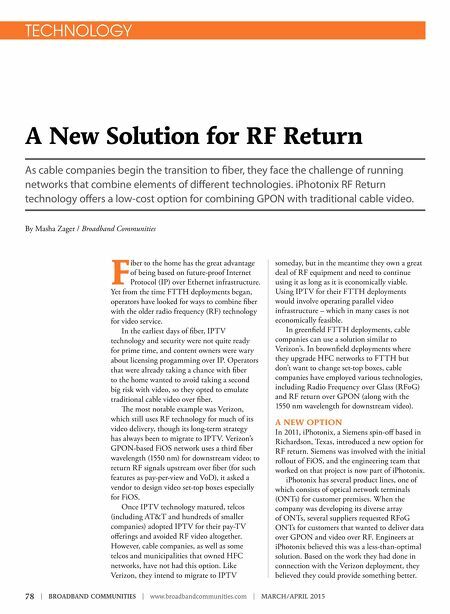 78 | BROADBAND COMMUNITIES | www.broadbandcommunities.com | MARCH/APRIL 2015 TECHNOLOGY A New Solution for RF Return As cable companies begin the transition to fber, they face the challenge of running networks that combine elements of diferent technologies. iPhotonix RF Return technology ofers a low-cost option for combining GPON with traditional cable video. By Masha Zager / Broadband Communities F iber to the home has the great advantage of being based on future-proof Internet Protocol (IP) over Ethernet infrastructure. Yet from the time FTTH deployments began, operators have looked for ways to combine fber with the older radio frequency (RF) technology for video service. In the earliest days of fber, IPTV technology and security were not quite ready for prime time, and content owners were wary about licensing progamming over IP. Operators that were already taking a chance with fber to the home wanted to avoid taking a second big risk with video, so they opted to emulate traditional cable video over fber. Te most notable example was Verizon, which still uses RF technology for much of its video delivery, though its long-term strategy has always been to migrate to IPTV. Verizon's GPON-based FiOS network uses a third fber wavelength (1550 nm) for downstream video; to return RF signals upstream over fber (for such features as pay-per-view and VoD), it asked a vendor to design video set-top boxes especially for FiOS. 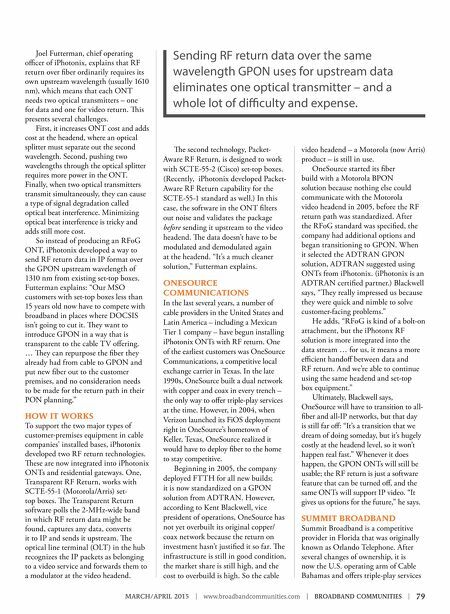 Once IPTV technology matured, telcos (including AT&T and hundreds of smaller companies) adopted IPTV for their pay-TV oferings and avoided RF video altogether. However, cable companies, as well as some telcos and municipalities that owned HFC networks, have not had this option. Like Verizon, they intend to migrate to IPTV someday, but in the meantime they own a great deal of RF equipment and need to continue using it as long as it is economically viable. Using IPTV for their FTTH deployments would involve operating parallel video infrastructure – which in many cases is not economically feasible. In greenfeld FTTH deployments, cable companies can use a solution similar to Verizon's. In brownfeld deployments where they upgrade HFC networks to FTTH but don't want to change set-top boxes, cable companies have employed various technologies, including Radio Frequency over Glass (RFoG) and RF return over GPON (along with the 1550 nm wavelength for downstream video). A NEW OPTION In 2011, iPhotonix, a Siemens spin-of based in Richardson, Texas, introduced a new option for RF return. Siemens was involved with the initial rollout of FiOS, and the engineering team that worked on that project is now part of iPhotonix. iPhotonix has several product lines, one of which consists of optical network terminals (ONTs) for customer premises. When the company was developing its diverse array of ONTs, several suppliers requested RFoG ONTs for customers that wanted to deliver data over GPON and video over RF. Engineers at iPhotonix believed this was a less-than-optimal solution. Based on the work they had done in connection with the Verizon deployment, they believed they could provide something better.